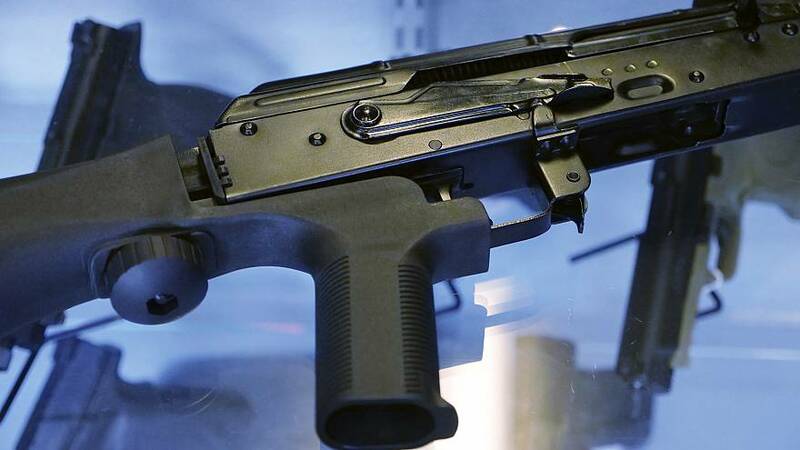 WASHINGTON — The U.S. Supreme Court declined Thursday to take up an appeal challenging a federal ban on bump stocks that went into effect Tuesday. After the Trump administration outlawed the devices — which allow rifles to be fired rapidly — owners, dealers and manufacturers were required to destroy them by midnight Monday or turn them into a local ATF office. Federal authorities estimated that half a million were sold in the U.S.
Bump stocks figured prominently in the 2017 mass shooting at an outdoor concert in Las Vegas that killed 58 people and wounded 500 others. Of 22 semi-automatic rifles in the hotel room used by the gunman, 14 were equipped with bump stocks, prompting President Donald Trump to push for a ban. Gun rights groups filed two separate Supreme Court appeals. One, directed to Chief Justice John Roberts, was rejected Tuesday. A second, filed with Justice Sonia Sotomayor, was turned down Thursday after she referred it to the full court. In both cases the court gave no explanation, following its usual procedure. A lawsuit challenging the ban remains before a federal court in Washington, D.C. The two Supreme Court appeals sought a temporary halt to the ban while the lower court case was pending. Once attached to a rifle in place of the normal stock or end piece, bump stocks allow rounds to be fired in quick succession, nearly as fast as an automatic weapon. The Trump administration concluded that they violated a federal law banning machineguns, defined as weapons that automatically fire more than one shot "with a single function of the trigger." An ATF spokesman declined Thursday to say how many bump stocks were surrendered before the ban went into effect, adding that the agency "does not feel the number turned is an accurate depiction, because there were alternative method of disposal." However local ATF offices around the country said very few were turned in. An exception was in the state of Washington, where 1,000 were turned over to the state patrol. However, each person surrendering a bump stock received $150 under a state buy-back program.